George was born and raised right here in Central Kentucky has been hunting and enjoying the outdoors his entire life. Much of his hunting as a child happened right on the very same farms we still manage today. He has been managing a lot of this land for almost 20 years. George is married with 2 boys, ages 12 and 7. He has had a love for the outdoors his entire life. He began hunting with his dad at a young age and he is teaching his boys the same way his dad taught him. Salt River Outfitters is a big family, everyone that comes to hunt becomes a member of the family. He will make sure you are prepared for the hunt, whether its your first time hunting or you are a seasoned veteran! George also loves to show people around central Kentucky while they are here hunting; from the bourbon distilleries to the horse farms and Keeneland (horse racing track), there is plenty to see and do in Central Kentucky if you have free time while you are here. Contact Salt River Outfitters for your guided hunting trip today! Salt River Outfitters is located on the “Bourbon Trail.” As an added bonus, as you stay with us, you can tour many of the bourbon distilleries on the “Bourbon Trail” that are located within 30 minutes of us. If a tour is desired, we can arrange it for you during the day before your evening hunt. We have some very good early season velvet archery hunts and our rifle hunts are right in the middle of the rut. 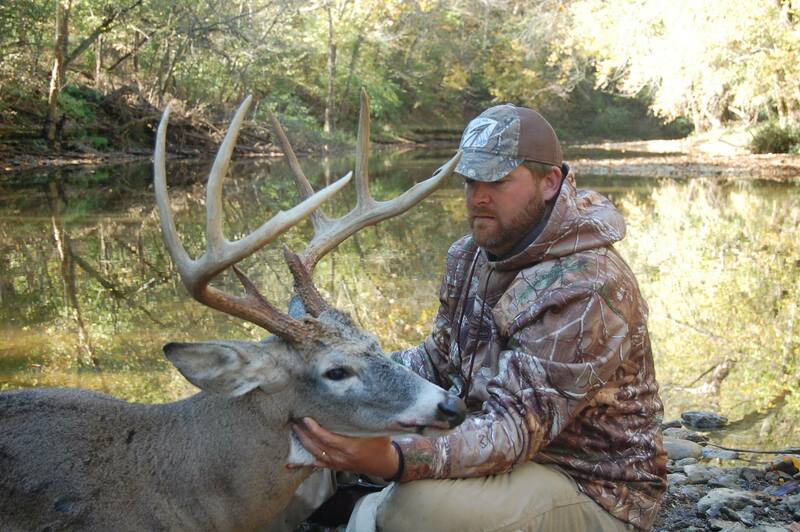 Don’t overlook our black-powder hunts; early and late seasons have great opportunities. Contract Salt River Outfitters to set up your guided hunt today! Best hunt and biggest and most Whitetail bucks I have ever seen in the Kansas location! Can't wait to try out there Kentucky location. All we can say is that this is a great place! George and his guys go above and beyond to make your experience one you will never forget. You feel like family with these guys. My crowd will be back year after year. Awesome deer, lodge and guides. I just wanted to share my experience with you all! I have been hunting with George Cummins at Salt River Outfitters for the last 3 years! First I wanna say the people at camp are like family! We keep in touch throughout the year waiting patiently for the opportunity to release an arrow at one of these Kentucky giants. You don't just go hunting a stand hoping to see a shooter, without the wind being the main factor! I personally passed on a solid 135 inch deer prior to shooting this huge framed 165 inch giant in full velvet! I'll continue to keep in touch with my friends at Salt River Outfitters and I'll try to be patient for next year! If you're​ looking for a place to hunt you owe it to yourself to talk to George before making your decision! One the best hunts I've been on. George, Joey and Hunter go the extra mile to make sure your hunt is successful. Booking for next year. Sign up for the Salt River Outfitters newsletter to receive information on hunt opportunities.